Ahead of My Time, Behind on My Rent: Cuddling With A Crackhead?! If you’ve ever wanted to cuddle up with Amy Winehouse, the folks at Bad Taste Bears have something for you. The British toy company has created a teddy bear in our favorite crackheads image. 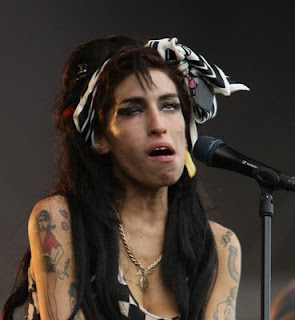 She has thick eyeliner and a tall beehive, pinned back with a syringe and cigarette, while showing off a suggestive 'coke' tattoo and singing into a microphone."